… but it does not. Paper towels, napkins, tissues and diapers are among the items considered “contaminated” and should go in the trash. 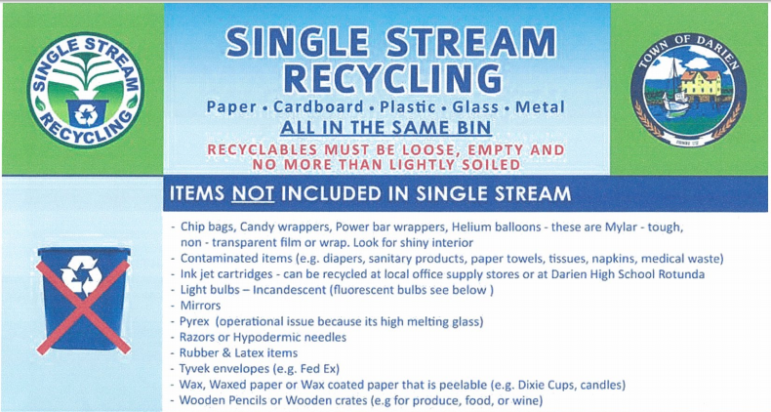 For a complete list of items not included in single stream, click here [to the Recyclng Center’s tip sheet for what to recycle and what not to recycle in Darien] and scroll to the top of page 2 [or see below]. — an announcement from the Darien Recycling Center on Facebook. Like that page on Facebook and you can get your tips directly, as soon as they come out, and keep informed on other recycling information. Part of the Darien Recycling Center\’s tip sheet on what to recycle and what not to recycle. 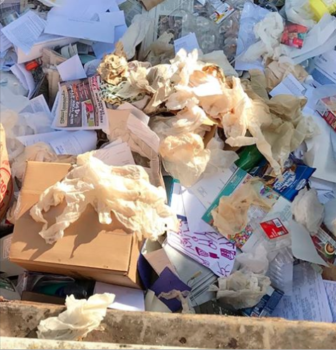 Some items not included in single-stream recycling can be recycled elsewhere at the Recycling Center/Transfer Station/”Dump” —but not used paper towels (follow the link above to the full PDF to get more information).